Pvt. 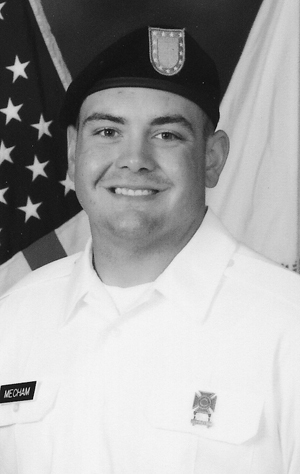 Kyle Wayne Mecham of Grantsville, Utah, successfully completed basic training for the US Army at Fort Benning, Georgia, and graduated on June 15, 2017. He then completed six weeks of A.I.T. training and graduated from Fort Leonardwood, Missouri, on Aug. 3, 2017. He is now based at Fort Bliss, Texas. Kyle is married to Ronnie Mecham of Stansbury and has a baby son, Kylen J. Mecham. He is the son of Chad and Jennifer Mecham of Grantsville, and grandson of Sharon and Bob Owens and Kenneth Mecham of Grantsville. Kyle is the son-in-law of Steven and Charity Mays of Stansbury.